Today a bit a different blog post, but a very important one! Sadly, there has arisen in Russia a very disturbing situation with polar bears. The plight of polar bears in Russia hangs in the balance if legislation currently before the Russian Government is passed. The total number of polar bears in the wild is only about 20,000. Part of the Chukchi-Alaskan population, which was almost exterminated by the middle of the twentieth century, lives on the Chukotka Peninsula (North-East Russia). At present, specialists estimate its size to be no greater than 2,000 bears. After the USSR imposed a moratorium on polar bear hunting in 1957, Russian coast was a stronghold for polar bear conservation for decades, and the Chukchi-Alaskan population had a chance to increase in numbers. Unfortunately, poaching also increased in the Chukotka region, and has been thriving there, particularly since the 1990s. Poachers now kill up to 300 polar bears a year for their pelts, and do so without even trying to conceal it. There is a huge black market for those pelts, with each one selling for about $20,000. In 2007 a bilateral Russian-American agreement on the conservation and management of the Alaska-Chukotka polar bear population was legislated, mentioning a possibility of issuing a hunting quota for indigenous people on both sides. Disregarding the fact that IUCN’s Polar Bear Specialists Group considered situation with polar bears critical, Russian-American Polar Bear Commission issued a resolution that a quota may be introduced on both sides of the Bering Strait. The decision was reached despite the fact that there are not enough data on the size of the population. Moreover, the possibility of a moratorium was not even considered. Now, in December 2010, after more than half a century of moratorium, the hunt may be re-opened in Russia! Global warming has been rapidly shrinking the extent of the Arctic sea ice, the major platform from which polar bears hunt during most of the year. 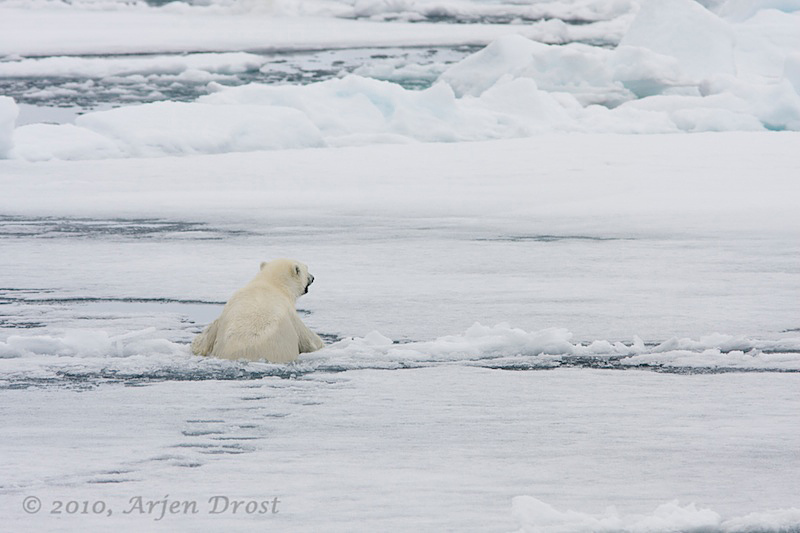 It is difficult for polar bears to survive the ice-free seasons because their main habitat (drifting ice) is shrinking, and what remains is far from the best hunting grounds. More and more often in recent years, scientists have observed famished bears, as well as fewer females showing up to den on Wrangel Island, the main polar bear “maternity ward” in the Chukchi Sea and a protected Nature Reserve since 1976. Under these stressful conditions, the impacts of poaching on the polar bear population are disastrous, and implementation of hunting will simply constitute legalization of poaching, and a cover for the poachers. As regards traditional use, the indigenous people of Chukotka have never hunted polar bears for subsistence. Legalization of polar bear hunting is just a path to the commercial use of the species. Although a quota is intended to be issued only for “subsistence” use by indigenous people, trophy hunters are actively lobbying for implementation of the quota, which, in itself, is revealing as to the consequences of legalizing polar bear hunting. It is not global warming that is dangerous for polar bears; the species has survived cyclic warm periods and glaciations before. It is the presence and activity of humans in the Arctic that pose a very real threat for bears. With all the pressures on the population now, it is disastrous, malicious, and inhumane to open the hunt. It would be tragic to lose such a unique species because of greediness and cynicism of a small group of people that is interested in exploiting these animals for profit. We are deeply unhappy with this situation and are trying to raise people’s awareness and to convince the Russian government not to legislate polar bear hunting. It is not too late, and we have to do everything possible to express the discontent of the people. Please, distribute this information to as many people as possible so that they are aware of the problem. Pass it on to the media, and to your friends by email, Facebook, Twitter, and other social media if possible. The petition will be sent to Russian Minister of Natural Resources. Please, help us protect the polar bears before it is too late! Save them, it is a beautiful bear of the north polar!